A typical Yellowstone visitor might see one, two, or even three geysers erupt during their visit; this was to be an epic day for me. It began with a humble goal of observing Grand Geyser in action, a spectacular fountain-style spouter that erupts every 5.5 to 7 hours. I knew its approximate eruption time from the previous day, so I skied out in what I thought might be its window of opportunity. And there is where I had the extreme good fortune to run into some folks from GOSA — Geyser Observation and Study Association. These amateur geothermal junkies hang around the park with two-way radios, documenting every possible detail about each eruption they see. They update a website in real time, as well as calling the visitor center. And they love to share their passion with bystanders. If I had known I’d be waiting 85 chilly minutes for Grand, I might have changed my mind. But in those 85 minutes I learned a lot from the GOSA geyser-gazers. Soon I hear him radio in: “Grand pool is full. Grand pool is full.” The other observer climbs up on a bench and announces, “Waves on Grand. I see waves.” Their excitement is palpable. It’s about to happen. Well, Turban had a delay, and the pool level dropped, and GOSA-guy explained that when that happens, Grand is usually reluctant 20 minutes later so perhaps we should hope for the 40-minute-away cycle. I made a mental note that geysers are complicated. A huge steam cloud rose from across the Firehole River. “Castle Geyser, start, 10:55,” he radioed. I skied over to Castle (#5) and got there in time to see the end of its minor eruption. Glorious stuff. Skied back to Grand. “West Triplet, 11:14.” (#6.) This bubbler is on the same mound as Grand so I asked whether it might be an indicator. “Sometimes yes, sometimes no; depends…” came the reply. Geysers are complicated, I thought, as I watched hot water flow beneath the boardwalk. And then, at the 40-minute mark, everything started happening at once. Percolator Geyser (#7) started percolating right in front of me, waves became visible on the very full pool, and then one vigorous introductory BLOOP released the pressure-valve and Grand (#8) flung boiling water 125 feet into the air with furious intent. Turban (#9) went off behind it, and Vent (#10) started shooting sideways next to it. 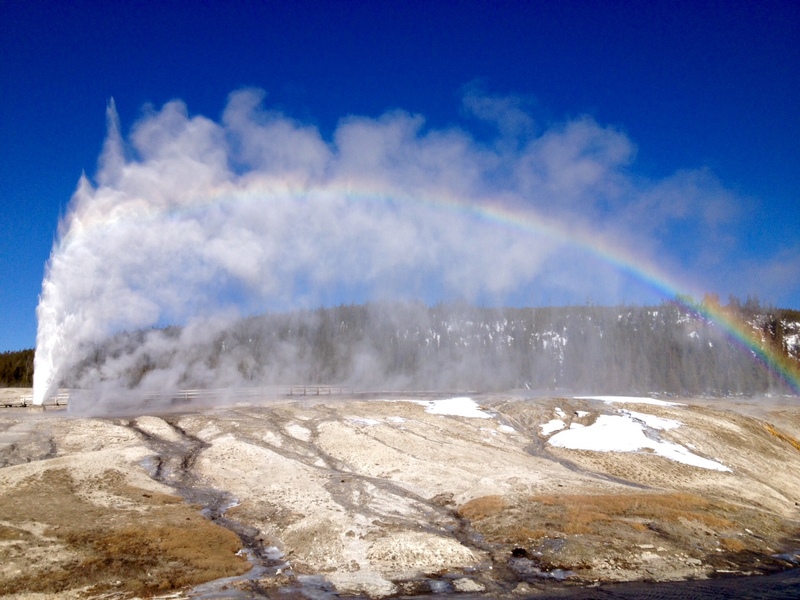 It was geyser overload, five at once, a ten-minute show like no other. 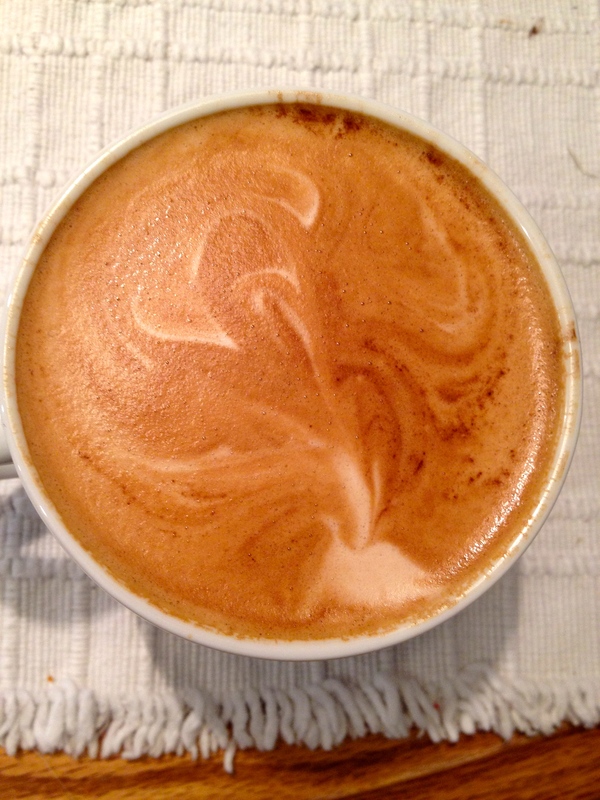 Even my cappuccino inadvertently depicts an erupting geyser. I will admit that I squealed involuntarily with delight. 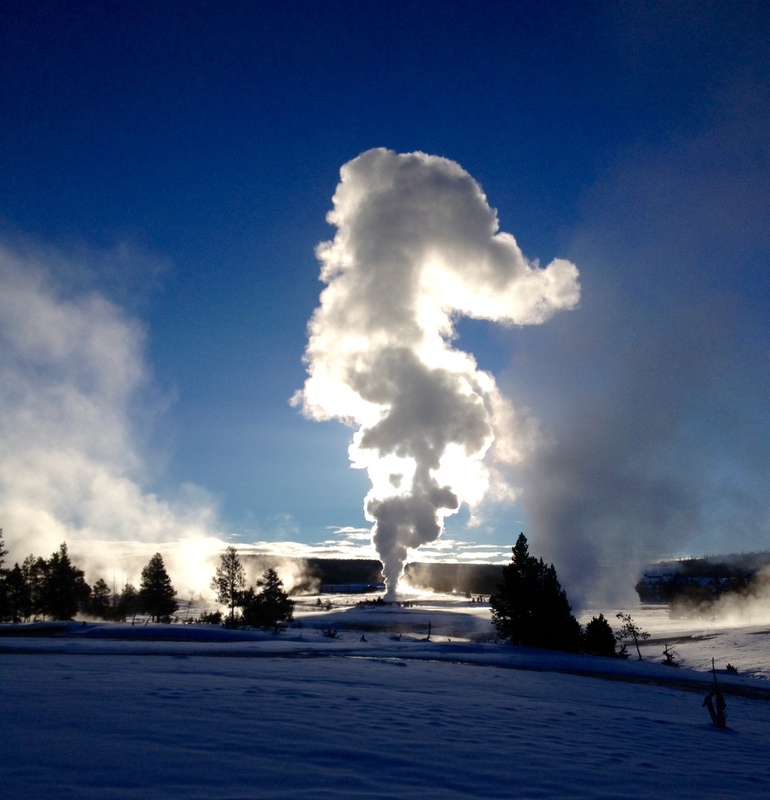 As I skied back to the visitor center wondering how my day could have been so exquisite, Beehive Geyser (#11) sent up its huge noisy once-a-day jet, and Old Faithful (#12) burst into the sky one more time for me. I felt a tear of gratitude roll down my cheek, fall to the ground. A lovely thought came: in about five centuries, that teardrop may be recycled as geyser water. I wonder who will be at Yellowstone then?